Happy Monday everyone! It's that time! That's right, episode 13 of the nosh show is here! Click here to listen or download! We followup with reviews of McDonald's Mighty Wings, Cotton Candy Grapes, Arby's, and Yummy Mummy cereal. We'll cover some explosive nosh or nots and then chew on this turns into the most intense cereal debate ever recorded on a podcast... or maybe not, but it was fun anyway. Curse you Marvo for being right in the end!! It all wraps up with our nosh of the week. Arby's Salted Caramel Shake - how bad is it? 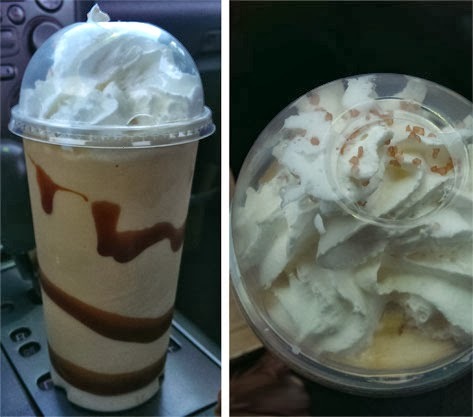 There were quite a few items tried between shows, but the frozen treat we need to talk about right now is this Arby's Salted Caramel shake that has appeared on several review blogs. This thing seems to be all over the place with nauseating some and pleasing other. The reviews are so mixed that I might think my sample a fluke had it not been for the similar positive experience had by Brand Eating. I will admit that I had been scared off from it, but now I'm glad I tried it. It's not bad, in fact, it's pretty good. No, this isn't some 6-7 dollar cold stone shake, but for a fast food shake, it's just fine. Rather than throw the caramel sauce from the hot caramel sundaes into the shake mix (like McDonald's did). It's kind of funny because the McD shake was still pretty white while this one had a nice tan coloring that translated to a decent caramel flavoring throughout the shake. It was ice cold and it hit the spot. It went great with the fries... well great if the curly fries had been hot anyway, but it was a still good combo. In fact, I wish I had just skipped the smokey brisket sandwich and focused more on the shake. I liked this shake, plain and simple. If I think really hard, I think I taste a hint of salt, but it's nothing crazy. The salt on top is just decoration really, it's the shake itself that has the hint. I also tried eating the swirl when all was said and done, and it's tasty too, there's nothing wrong with it, no crazy saltiness. Hopefully this shake is a sign that those early shakes were the fluke and now it's safe to try this treat. Let me know if you've had it! 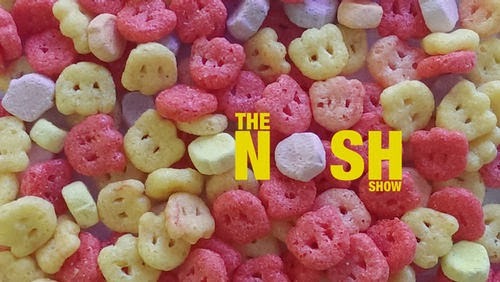 Today's Nosh show was particularly funny especially the Little Bites debate. I could've sworn they had a bit of chocolate inside them too!